Today I just want to post a few pictures of my winter garden. Last winter I started experimenting with four season gardening, but I only planted a few things. This year I have a whole bunch more. 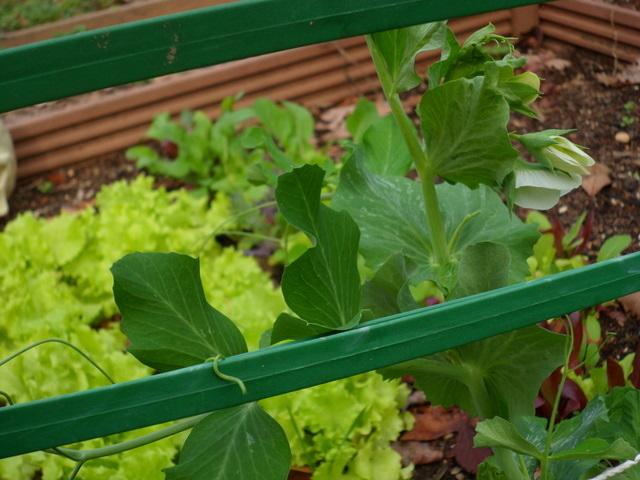 These are peas with lettuce in the background. I had peas for a while this spring and harvested quite a few, but for a very short time. By the time we got to May it was already too hot for them. This is one of my favorite crops. They are easy to plant, easy to grow, have pretty white flowers and make a weird squeaky sound when you touch them. There are lots and lots of flowers right now, so I should have a crop of peas to eat in the next few weeks if this amazing weather holds. Even if not, as long as it does not get too cold these plants should be ok. This picture is of chard, onions and carrots. All are from seed. The odd part is the onion seeds were planted last spring. Not sure why they decided to just hang around and wait until now, but that is OK. They need to do whatever works for them. I put some compost and lime on the chard yesterday. This is my first time using an additive for a specific plant. I normally work under a system of everyone gets dirt and compost and the strong survive. 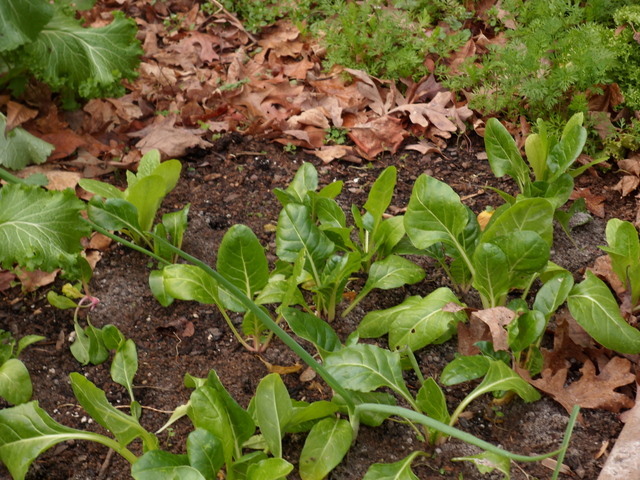 But I really want chard to be big and delicious for New Years, because those are my greens of choice. The carrots have nice tops but the carrot part is tiny because the soil here has too much nitrogen. I don’t have a good plan on how to deal with this. Each year my soil will get better, so where do I put the plants like carrots and sweet potatoes that grow best in bad soil? 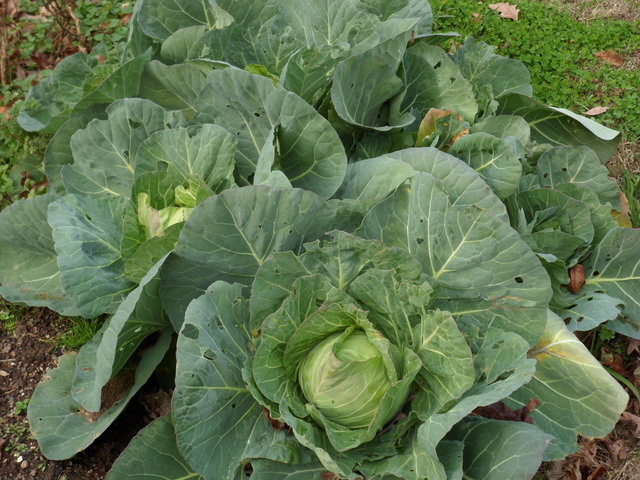 This is the only time I have had success at brassicas, which I have up until now planted in the spring. These had a few bug problems early on, as you can tell from the outer leaves. But the first frost mostly fixed that. It killed the moths and the cabbage worms, but from time to time I still see these ashy gray aphids. Since then they have been growing like crazy. I am actually amazed at how big they are. Had I realized this, I might have planted them further apart. There are 6 plants in a 3×4 area. I am going to harvest the one in the front for dinner tonight. Mmmmm corned beef and cabbage. The flavor of the outer leaves is a little spicy and bitter, different than cabbage normally is, but I like it. The last picture is of my artichoke patch, all finished and sincere. These were planted last spring, but pretty much left to their own devices. With having a job and the big garden in the front, I never got around to even watering them. Somehow they were still alive when I was raking a few weeks ago, so I decided to build a special area around them so I could not forget them again. The fence is the wattle I was building in the last post, and the border is $20 of landscaping timbers. The plants are noticeably bigger just in the last few weeks.